Most Catholic parents who are intent on passing on the faith have favorite family religious traditions during Advent, Christmas, Lent and Easter. However, those weeks cover less than half the year. The rest of the year is Ordinary Time, green vestment time. How can parents use those weeks to help children live the faith? 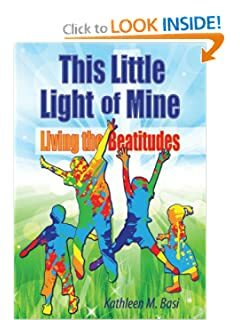 That is the question that Kathleen Basi attempts to answer in This Little Light of Mine: Living the Beatitudes . In a nine chapter book Basi uses the framework of the Beatitudes to cover the topics of Living in Humility, Suffering Freedom and Sin, The Gifts and Fruits of the Holy Spirit, Liturgy and the Liturgical Year, Putting the Focus on Mercy, Sacraments and Private Devotions, Celebrating the Saints, Persecution in the Modern World and Putting It All Together. Each chapter has a section for adults, a section for children and a section called "Just Live It" which gives ideas for family activities based on the topic at hand. For example, the chapter on Putting the Focus on Mercy deals with the fourth through the tenth commandments. Dealing with the commandment on adultery, Basi admits that most of us will never commit adultery, but she points out that fidelity in marriage does not end with staying out of other people's beds but includes honoring each other and treating each other during conflict with the respect we want to receive. The "Just Live It" section includes a suggestion to devote one or two nights to couple time, turning off the TV, computers and phones after the kids go to bed and spending couple time together working puzzles, talking, or reading together. The kids' section says that adultery is when married people break their promise to be faithful to their spouse. It tells the kids that they can practice by being faithful to friends and family members, and that when you talk about them, say only things you wouldn't mind them hearing. I liked Katheen's concrete ways to make the faith relevant to today's life. I liked her adult explanations of the Beatitudes and the Commandments. The book is a good basic guide to Catholicism, easy to read, hits the highlights and relates them to daily life. I'm less fond of the instructional sections for kids. I just can't see reading that much verbiage to my nine year old or to a younger child, especially as there are no pictures in the book. I can easily see incorporating some of the "Just Do It" ideas in our lives. I'd like to thank Kathleen and her publisher for providing a complimentary review copy. Kathleen is a regular participant in Sunday Snippets--A Catholic Carnival, which is a weekly gathering of Catholic bloggers which is hosted here. I've previously reviewed her books on Advent and Lent and you can read her blog here. Grade: B.
I have a copy of this book to give away to one of my readers (US only). To enter the giveaway, leave a comment saying why you want the book, and including your email address. For a second entry leave a separate comment telling about a faith-sharing activity you do with your family during Ordinary Time. For a third entry, (or second if you don't do the other) participate in Sunday Snippets--A Catholic Carnival on April 6-7. You can participate as a blogger by linking up a relevant post and then leaving a comment here saying you did so or as a reader by commenting on three of the linked posts and leaving a comment here saying you did so. Finally, you can get an entry by spreading the word about this giveaway either by way of your blog (leave a comment with a link) or by way of Facebook (leave a comment telling me you did). I just saw this book at the Liguori facebook page! I'm an Anglican priest and would love to use this book as a resource for a Confirmation class for teenagers. Me and my boys try to pray every night before bedtime regardless of the liturgical time of the year. We're not always successful but it's our custom. We often throw a Bible passage and comment on it before praying. This sounds like a wonderful book! I'd love to use it with our two sons. I would love to give this book to my son to share with his children. Thanks! Hi RAnn, I would love this book to use with my son and with my class. I believe it will give me great ideas to use when teaching our faith. Thanks RAnn for the opportunity to enter your giveaway! God bless!